Never boil a hard “boiled” egg again! The trick for easy peeling and avoiding that grey ring from overcooking is to steam them. Full directions below. 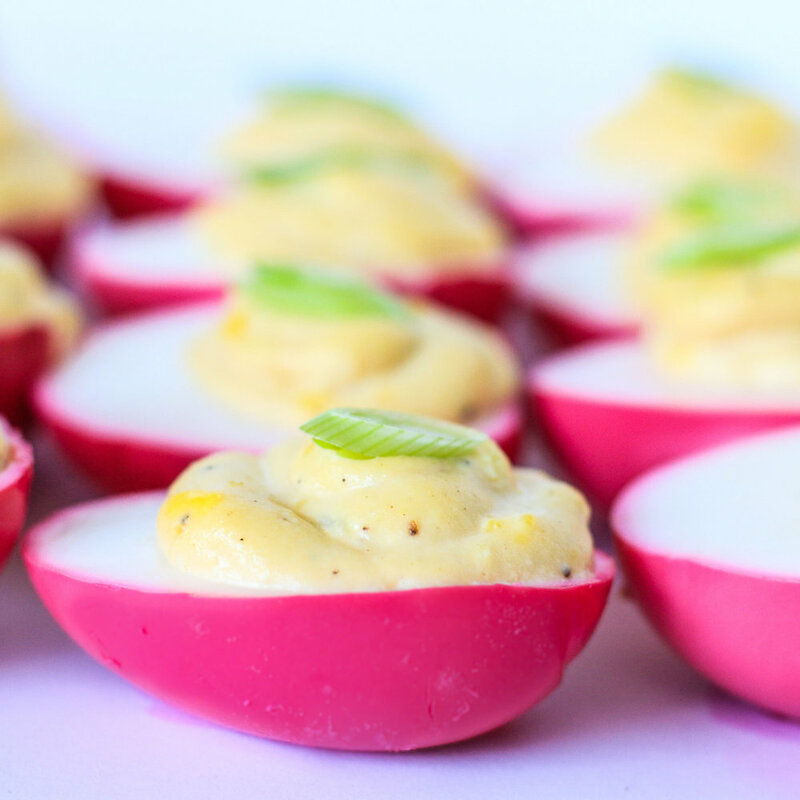 I think the pink dyed outside really elevates this retro appetizer but if you are short on time the classic recipe without the beets tastes just as great. I double this recipe because I love having these ready in the fridge for a quick nutritious snack! To steam your eggs, fill a medium sized saucepan (with a fitted lid) with 1/2 an inch of water. If you have a steamer basket, place it over the water. Cover and turn the heat to high. Let the water come to a boil, turn off the heat and then gently lower your eggs into the water (or the steamer basket). The eggs should be in a single layer. If your pot is too small and you have to stack the eggs on top of each other, then you will need to add an additional two minutes to your cooking time. Turn the heat back on to medium high and cover with a lid. The length of cooking time depends on a few factors, including the size of your eggs, how cold they are when they begin the cooking process and even the altitude of where you are living. My large eggs took 14 minutes to get the perfect hard boil. While the eggs are steaming now is the time to get your beets going. Place the sliced beets, water, vinegar and salt in a small saucepan. Bring to a boil and cook for 20 minutes. When the eggs are done cooking, transfer them to a bowl of ice water. This will help the membrane separate from the shell for easy peeling. Crack the eggs by tapping them on the bottom (the wider end of the egg). It’s much easier to start peeling from the bottom because there is an air pocket on that end. I like to peel mine under the ice water to make it even easier. When the beets are done cooking, remove from the pan from the heat. To speed along the cooling process, put the saucepan with the beet juice in another ice bath. Once the beet juice has cooled completely, remove the beets and discard. Place the eggs either directly in the saucepan with the beet juice or transfer the juice into a large Ziplock bag and place the peeled eggs in that. All of the eggs must be completely submerged in the juice to ensure that they color evenly. It’s okay to add a little bit more water to the beet juice to ensure that they are fully submerged as long as you do not over dilute the juice. Let the eggs soak for an hour. Remove the eggs from the juice and slice them in half, lengthwise. Gently remove the cooked yolks and place in a small mixing bowl. Add the mayonnaise, mustard, hot sauce, garlic powder, onion powder and salt and pepper. Mash and whisk using a fork until very smooth and well combined. I placed the yolk mixture into a piping bag to fill the hollowed-out egg whites but you can skip this step if you like and simply spoon the yolk mixture back into the halved eggs. Top with a sliced green onion and enjoy. Cover and refrigerate if not consuming right away.